Leave for office before the salon opens, and back after it’s shut? Thanks to At Home Diva, though, now you can just chill, and get spa and salon services right at home. Not enough time to get to a spa or salon? And when you have time, you’re too lazy, no? I feel your pain! But I’ve found AtHomeDiva, a service (part of QuikrEasy) that lets you sit at home, watching television, while they work their magic on you. 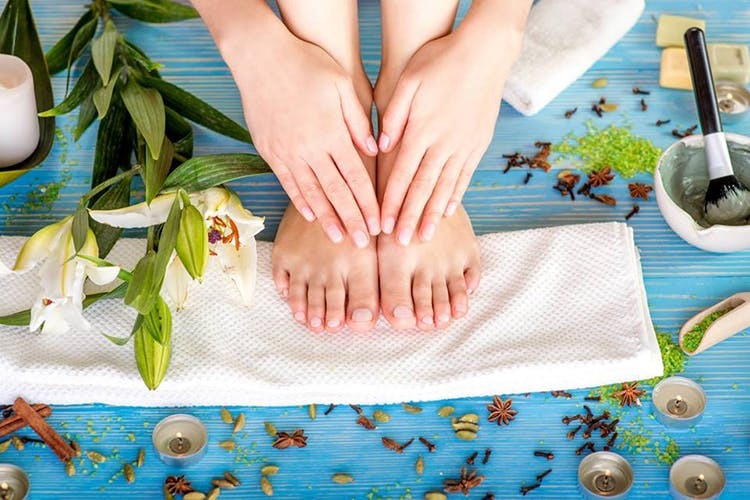 They offer services such as waxing, mani-pedis, body and hair spas, in addition to threading, henna colouring and facials. I decided to tame my unruly hair with a spa, and pamper myself with a mani-pedi. I picked 4.30pm, and at 4.29pm, Yankee, my therapist showed up with a smiling face, and a massive suitcase. From the suitcase came a protection mat to cover about 6×6 feet of floor, a foot bath (yes! ), scrubs, lotions, oils and everything needed for a proper hair spa and mani-pedi. After a quick hair wash and change of clothes into a disposable gown, my hair spa began. Using Moroccan oil and detoxifying clay, from L’Oreal, my therapist then began a soothing head, back and neck massage that put me to sleep within five minutes. The idea is to help circulation in the head and scalp for healthier hair. The mani-pedi too was relaxing, and started off with a soak in hot water and a strawberry and margherita bomb! Then came the scrubbing to exfoliate the skin, a quick massage, and then a nail brush to eliminate the dead skin. Post that I had to sit still with a skin pack, after which lotion was applied. I later realised that all the whole manicure and pedicure was a strawberry and margherita pack, leaving me smelling like a tropical island, and smiling like I was on one! Service was prompt, polite and customised (she’ll ask if pressure during massages are to your liking, how you want your nails cut, and what polish colour you’d prefer), and well worth the money. My session was about INR 2,000, but you can choose shorter sessions, for a lesser price. Single services such as threading and bleaching begin at INR 40 while spa sessions are all INR 500 upwards.